PCB Fabrication Blind and/or buried vias are similar to traditional, multi-layer boards with through-holes in that these via create connections between all the layers of the board. 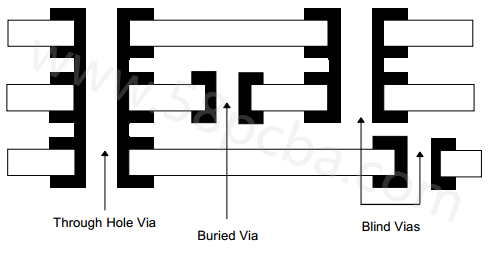 But one important difference is that blind and buried vias permit circuits of non-planar topography to be connected, which traditional multi-layer boards can’t do. This is an important difference and advantage since it economizes the use of space on the board by permitting only the required layer be connected. Shenzhen Grande Electronic applies specific definitions to the various types of drilled interconnections. ▪ Blind via: one that doesn’t go through the complete board yet can be accessed by one of the external layers of the board. Does using high voltages mean lower current?